the windows should be black. A work of art doesn't always make sense. It is made to make our souls lighter. I'm sorry it evokes suicides for you. Amazing Building. Love to see that. I did not want to spoil the party. I am part of the cultural stream as is the building and I know there is an urge to create art pour l'art .... this is OK.
Looks like science fiction ! Viewing tower, hamster cage? interesting and great photographic location, but I don't see a work of art. Well captured and thank you for sharing. Beautiful work, as always, Aguinaldo. The second photograph made me think of Escher, too. It is nice to see that architects can still have a bit of fun. Appears that any images taken of the structure, the creators are claiming publicly that they can take the images from anywhere and use them as they see fit. I'm not commenting on how I feel about it....just wanted to have that information available. Wikipedia: "Much of the criticism of Vessel has been of its photo policies. 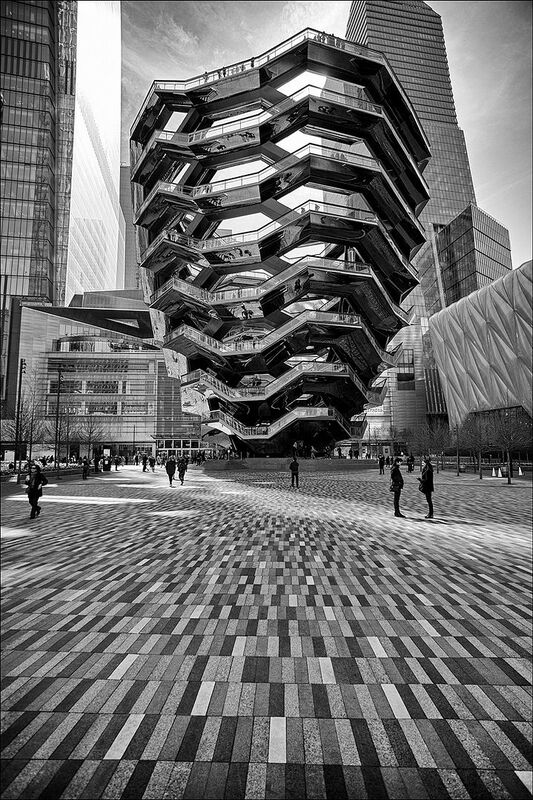 Hudson Yards, the owner of Vessel, claims ownership of all pictures and videos taken of Vessel, and reserves the right to use any photos or videos taken for commercial purposes without paying royalty fees. Under the copyright law of the United States, Vessel is considered a private artwork, so photos that feature only Vessel would be copyrighted. This privileged use of photos and videos by Hudson Yards, a private company, has been criticized because Hudson Yards has benefited from $4.5 billion in tax revenue. 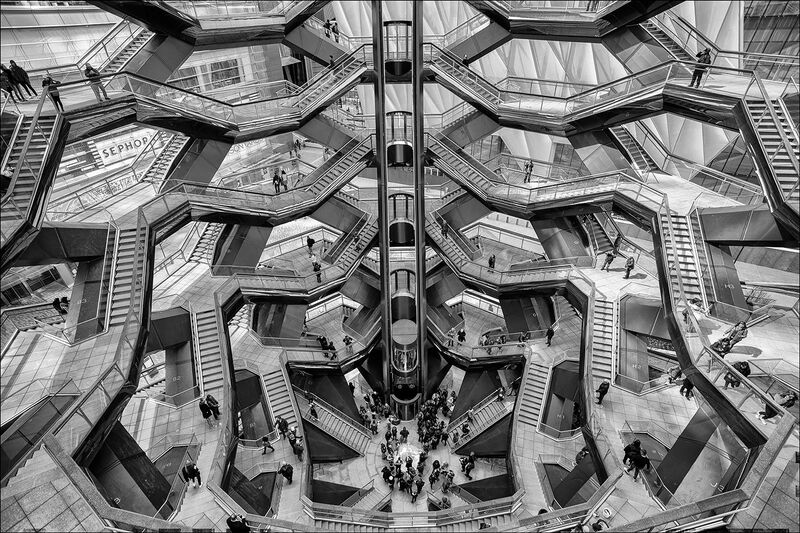 After criticism emerged about Vessel's copyright policy, Hudson Yards modified the policy so visitors would have ownership of photos of Vessel." By the way I’m getting sick of this always escalating need of control and security. Soon will come the day that you’ll need to fill a form to go to a public toilet and do a colonoscopy before taking a plane. Definitely Escher-esque. The second view ads to the perception of the installation. Your b&w conversions are excellent for my eyes.